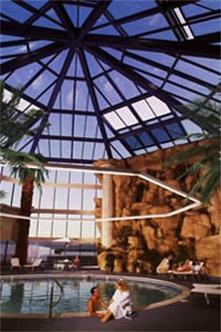 This casino resort and spa has a tropical theme with 1,000 luxury tower rooms & suites. Reno's only concierge hotel tower also has seven restaurants with "Reno's Best Buffet," as well as an exclusive lounge, a complimentary continental breakfast and afternoon hors d'oeuvres. There is also VIP check-in, a European-style spa & salon with indoor and outdoor pools.